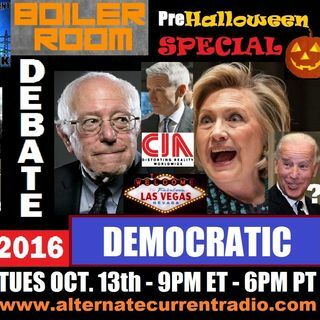 Join the Alternate Current Radio Boiler Room for this Democratic Debate Special! We’ll have your favorite cynics, philosophers, political animals, media maniacs, armchair anarchists, turntable troglodytes and barfly banditos in the peanut gallery for the upcoming debate. Don’t shake your head in lone agony watching the bought and paid for “candidates” spin their webs of 6th grade level lies, come join the Boiler Room gang in this gallows humor attempt at making the Democratic debate palpable, ... See More informative and FUN for all us informed, intellectual hominids and homunculi.